A brief legal battle related to the Barro Blanco hydroelectric project in western Panama concluded late last month in a rare triumph for indigenous communities who have opposed the dam’s construction for a decade. The dam’s construction company had accused three Ngäbe-Bugle leaders of instigating project delays and causing financial losses during protests at Barro Blanco’s entrance in July 2015. On September 20, a judge acquitted all three defendants of any wrongdoing. Nevertheless, the dam is now fully operational and its reservoir has flooded the land of three Ngäbe-Bugle communities. Leadership of the Ngäbe-Bugle is deeply divided between members who support the dam and those who oppose it, claiming that they had not been adequately consulted prior to the dam’s approval. A brief legal battle related to the Barro Blanco hydroelectric project in western Panama concluded late last month in a rare triumph for the impacted indigenous communities who have opposed the dam’s construction for a decade. Located along the Tabasará River, Barro Blanco has been the center of an intense human rights and environmental conflict that has generated countless protests by local Ngäbe-Bugle people over the flooding of their lands. The dam has also fueled deep divisions within the ruling body of their “comarca” — a semi-autonomous indigenous region located upstream of the dam. The project, partly funded by two European development banks, has also been condemned by national and international NGOs for failing to solicit the free, prior, and informed consent of the Ngäbe-Bugle people before being built. The conflict has pitted the local communities against the dam’s construction company, Generadora del Istmo S.A. (GENISA), and successive Panamanian governments. The recent legal case was brought before a district court in the province of Chiriquí on August 18. In it, GENISA accused three Ngäbe-Bugle leaders of instigating project delays and causing financial losses during protests at Barro Blanco’s entrance in July 2015. On September 20, a judge acquitted all three defendants, Manolo Miranda, Toribio García, and Clementina Pérez, of any wrongdoing. “This decision was completely in line with justice and the law,” said Miranda, a resident of the community of Kiad, which has had a large portion of its riverside land and crops flooded by the dam’s reservoir. According to Miranda, the company provided no concrete proof during the court proceedings that he or any of the other 60-plus protestors had trespassed on GENISA’s property or impeded the work of their personnel. Miranda and his opposition group, M10 (for “Movimiento 10 de Abril” or “April 10thMovement” in English), have continually called for the cancellation of the dam. This latest legal process was GENISA’s attempt to “criminalize their cause,” he said. “They persecuted our cause judicially, and with the endorsement of the national government,” Miranda said. “This decision reflected the real proof we provided that our land, crops, and homes are being inundated right now, and that our protests [in 2015] were to stop it from happening,” explained Miranda. GENISA did not respond to repeated calls and emails from Mongabay requesting comment for this story. In August 2016, however, the government reached a widely publicized “definitive” agreement with key Comarca leaders to complete construction of the Barro Blanco dam and flooding of its reservoir. During the signing ceremony, the agreement was firmly rejected by members of the affected communities, who claimed that they had not been adequately consulted. A month later the document was voted down during an extraordinary session of the Ngäbe-Bugle General Congress, the comarca’s key decision-making body. During that same session, the General Congress ousted its head leader, Cacica Silvia Carrera, for having signed the agreement without properly informing the indigenous decision-making body. Panama’s National Authority of Public Services (ASEP) had allowed GENISA to conduct “test flooding” of the Barro Blanco’s reservoir just days after the initial document was signed in August. Despite the General Congress’s rejection of the agreement in September, the flooding was not halted and three nearby Ngäbe communities — Kiad, Nuevo Palomar, and Quebrada Caña — began losing land, homes, and crops to the rising river in the ensuing months. In March of this year, ASEP’s administrator Roberto Meana told Mongabay that Barro Blanco was allowed to continue flooding the reservoir as the indigenous General Congress failed to provide the government with the necessary paperwork outlining its rejection of the agreement. Mongabay recently confirmed with Meana that the 28-megawatt dam has since entered into full commercial operation. This amount of electricity, according to government figures, will be able to power 67,000 homes in the country. Meanwhile, according to local newspaper La Estrella de Panama, the government tried unsuccessfully to pass the failed August agreement through the Ngäbe-Bugle General Congress on two separate occasions — the latest of which was on April 8 this year. 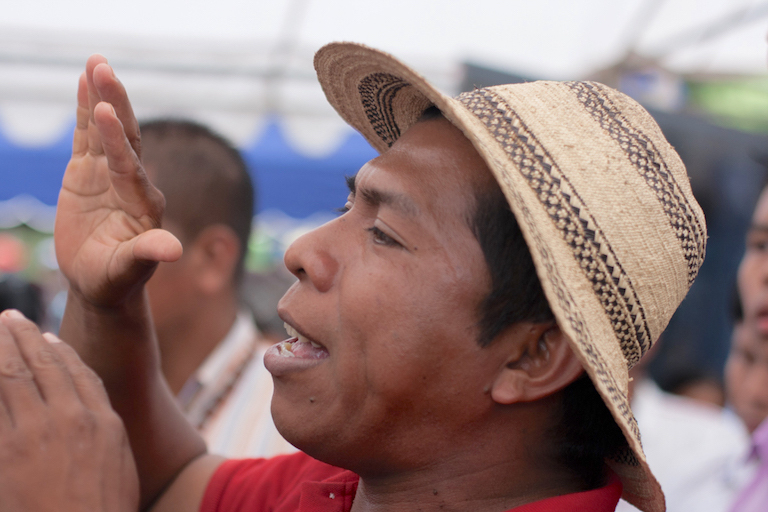 Panama’s Deputy Minister of Indigenous Affairs, Feliciano Jiménez, told Mongabay that during the last session the General Congress, which was without the required quorum, decided to ratify the agreement based on an internal rule. This statement, however, has been strongly rejected by Weny Bagama, a Ngäbe-Bugle General Congress delegate and leader of the M10. “Up until this point there has been no accord and no further negotiations with the government,” she told Mongabay. She explained that the government had “split the congress delegates” by negotiating with its former president, Demesio Casés, despite his having been ousted from his position in March this year. “The delegates [of the General Congress] have named a new president, but the government has kept Demesio there because it’s convenient for them,” Bagama said. Furthermore, she added, the government also continued to recognize the ousted Cacica, Silvia Carrera, as the leader for the same reasons even after her removal from office last year. “But the Congress is divided,” she said, referring to the issue of Casés’s position. She added that the General Congress was organizing an extraordinary session to resolve who should fill the disputed post of president. Deputy Minister Jiménez, who is a Ngäbe himself, confirmed that the government was aware of the division and was actively seeking unity on the issue to fully implement the accord. Since the test flooding commenced, the M10 and members of the three affected communities have asked for the dam’s water’s to be lowered to the comarca limits. Jimenez said this request cannot be granted as it would render the dam useless. “The government has responsibly accepted many failures of previous governments. We have to remedy this in another way, not simply by completely cancelling the project, because the state would have to pay millions,” he said. All the bureaucratic back and forth, and the divisions that are becoming increasingly apparent within the comarca’s leadership, has left the three affected communities in a precarious situation. 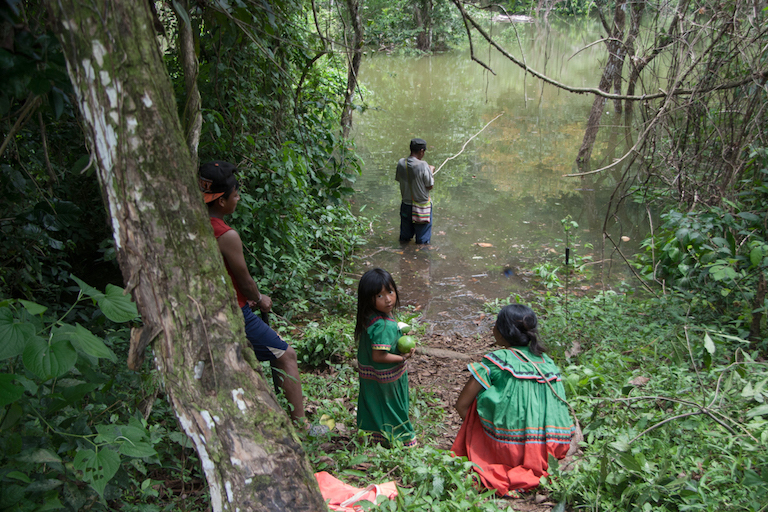 According to Manolo Miranda, the reservoir has made a deep psychological impact on the communities. It has impeded their mobility, flooded their crops, and bred swarms of mosquitos that have transmitted disease among the elderly and young children. 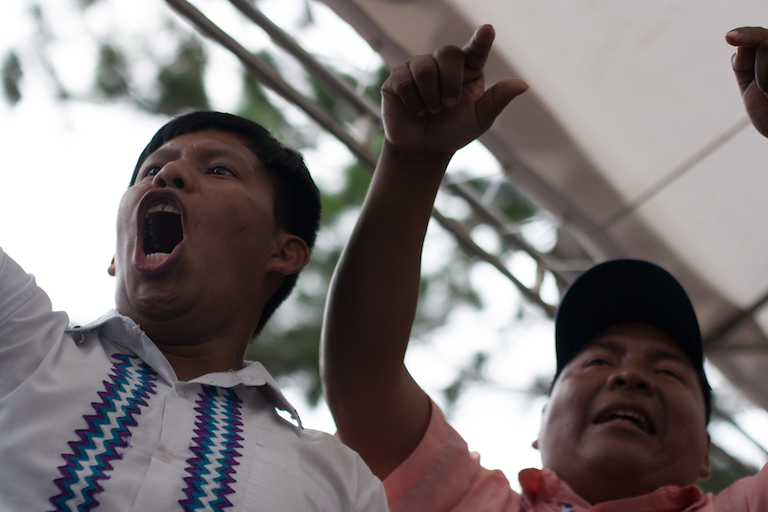 However, the nature of this latest legal process against Manolo Miranda and the two other leaders has raised concerns within ACD, which has supported the communities for years. Susana Serracín, ACD’s president, said that although this latest legal decision sets an important precedent for environmental activists fighting legal battles against development companies, the persecution of activists around the country is a worrisome reality. “As environmentalists, we see this [court] decision as the right and just one, because each day we see a concerning trend of social and environmental activists being persecuted by companies,” she told Mongabay. “These are tactics of intimidation, although in other countries there have already been more serious situations,” she said, giving the example of the Honduran activist Berta Cáceres, who was shot dead in 2016 over her opposition to a hydroelectric dam. “We have not reached these extremes here, but there is no state mechanism to defend these activists,” Serracín added. But this bleak national picture painted by Serracín for anyone opposing development plans, from extraction projects to housing developments, is not shared by Deputy Minister Feliciano Jiménez. Whether this latest legal case against him is part of a trend or not, Manolo Miranda says the process has only propelled his community forward. “We are happy that the judge has come to a decision. We are analyzing how to move forward with our fight, because this makes it clear that the truth was never on the company’s side but on our side, and that gives us strength to continue our cause,” he said.